When visiting the Caribbean, leave all your worries behind! You deserve a stress-free vacation in one of the most beautiful places in the world. The moment you step off the ferry on St. John, you’re on island time. This means lounging on the beach in the glorious sunshine, sleeping until noon in your comfortable bed, or drinking whenever as long as it’s “five-o’clock somewhere!” Whatever it takes for you to leave your troubles back home, we are here to help! Our CimmaronStJohn vacation homes feature luxurious accommodations, a responsive concierge service, and some magnificent views that will take your breath away. We also know some great St. John bars that will serve you delicious cocktails and help you unwind. Sit, back, relax, and escape to St. John! Find out more about all of the ways to relax when you read our detailed list of things to do in St. John. It’s full of the best recommendations for things to see and do, from St. John bars and restaurants to boat charters and spas! One favorite option of St. John bars is The Beach Bar! This great watering hole and venue features delicious food and drinks, musical guests, and even its own gift shop for souvenirs to bring back home. You will find an upgraded version of your average pub grub here, such as fresco tacos, a turkey bacon melt, pasta salad, and crab dip with tortilla chips. French fries, chips and salsa, and beach burgers are also in no short supply. Pair your plate with a frozen drink, like the famous Bushwacker, a Coconut Mojito, a Mango Colada, or a Cherry Limeade Slush. Live music will go along great with your mouthwatering food and drinks! For a more laid-back atmosphere, try The Tap Room brewpub with locally made craft beer and artisan sodas from St. John Brewers. The pub has been rebuilt and expanded following the fire that destroyed the interior several months ago. This is a great place to grab lunch and a cold beer after a sun-soaked morning at the beach or destination for some live music and island nightlife. Of St. John bars, The Tap Room is a local favorite with island-brewed Tropical Mango and Island Hoppin’ IPA beers and Root Beer on tap. Combine your beverage with a great appetizer, salad, sandwich, or wrap! Head to Skipper’s Brit Pub , the newest St. John bar and an exciting new alternative. Relax with a view of the boats in Coral Harbor and enjoy the selection of finest local brews and rums found in the Caribbean along with your selection from the great menu of British Pub fare with a Caribbean twist. The menu includes appetizers, soups, salads, sandwiches, and wraps. Pub favorite entrees include Steak & Mushroom Guinness Pie, Bangers-n-Mash, and Spicy Vegan Potato Curry. The hub of Cruz Bay nightlife gathers at Woody’s Seafood Saloon, one of the most popular St. John bars for partying and having a great time. The vintage signage and tastebud-tingling Caribbean drink menu are two fun factors. Try the Blue Motorcycle with rum and blue curacao or the Masswe Margarita on the rocks. A Strawberry Shortcake with vodka, Bailey’s, and berries makes the cut, along with the Surfer on Acid with Jagermeister, Malibu, and pineapple juice. Follow up your drink specials at Woody’s on St. John with some excellent seafood platters. These feature a mix-match variety of grilled or blackened fish, conch fritters, shrimp, scallops, and a bed of crab pasta salad. Voted not only one of the best St. John bars but best beach bars in America, Joe’s Rum Hut in St. John is a must during your island stay. Located on Cruz Bay in Wharfside Village, this bar is known for its famous Mojitos with fresh mint and fresh-squeezed limes. They are also known for some truly delicious coladas, daiquiris, margaritas, and quite the selection of rums. This ideal place for happy hour on St. John also features a great menu, with appetizers, salads, burgers, sandwiches, and homemade pizzas. Start off by sharing some Mahi Mahi bites or conch fritters. Then, try the grilled eggplant wrap, gyro, or a Caribbean lobster pizza! 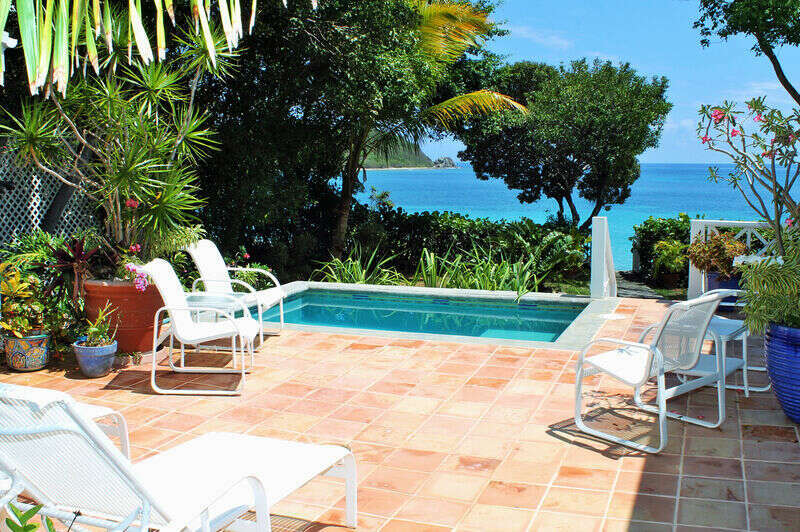 You won’t regret your decision to stay in a CimmaronStJohn vacation villa! We offer wonderful amenities and island luxuries that will be sure to put your mind at ease. Amenities include a blender in your vacation home to create your own island libations to sip while enjoying private ocean views! Let our concierge service help plan your vacation and worry about all the details for you. We know the best places to visit on the island to get the most out of your time! Then, once you’re ready to settle in at the end of the night, return to your private Caribbean vacation home for cool beach breezes, comfortable beds, and a place that will feel like your home away from home. Book your trip to paradise today!